My oldest has been in Germany since the beginning of August, and if I had known then what I know now, I wouldn’t have cried so much when she left! Though she is across an ocean, I have heard from her every single day. The reason? To pepper me with questions about how to cook this or prepare that. Now that she is on her own for the first time in an apartment, she has to cook for herself, and every evening, as she prepares her dinner, she texts or calls with several questions. So, not only am I not missing her because we speak more than we did while she was in college, but I have been happy to note that she is doing all she can on a limited budget with little cooking supplies to still try to eat as healthy as she can. In fact, she has an app she uses to help her make sure she gets all the nutrients and vitamins she needs from the food she eats. I am pleased that some of the lessons I imparted actually took root! 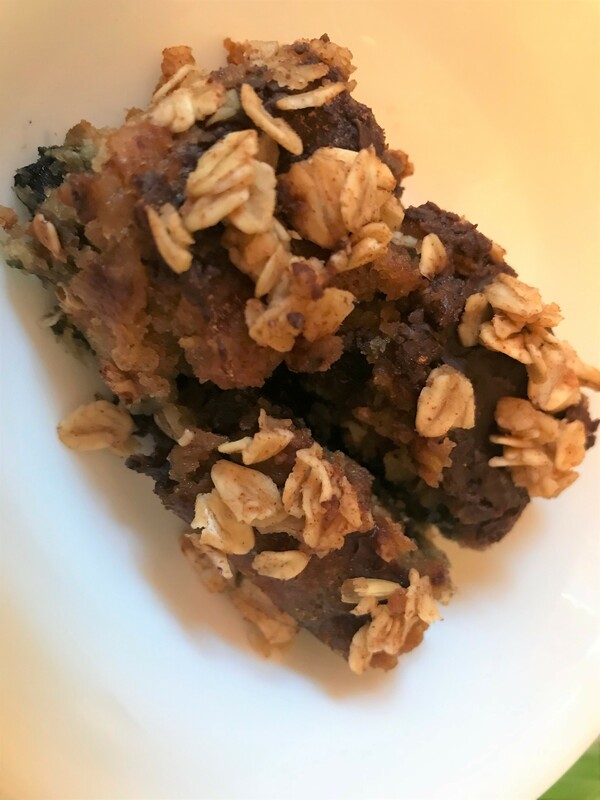 In the past couple of weeks, I have been working on those same lessons for healthy eating and revamped a couple of cake recipes for an uncle who is diabetic. He likes his sweets but white flour and sugar products don’t like him! Since dessert is something he often looks for, though, I put my hand to creating a couple of cakes which might be slightly better for him to consume. To make a healthier cake, I chose to begin with whole grain, whole rolled oats because they contain a lot of fiber and protein. Then, I removed the sugar, opting instead to use smaller amounts of coconut sugar and/or agave and fruit like blueberries and chunky applesauce which contain fiber as well. My last change was to reduce the fat by swapping a reduced amount of oil for the usual butter and to use egg whites instead of whole eggs. And of course, I made them gluten, dairy and tree nut free so I could eat them as well! Below is the blueberry oatmeal cake recipe. In a pan, melt 2 tbsp of vegan butter, add 1 cup of whole rolled oats with 1/2 tsp cinnamon and 1/4 tsp nutmeg. Cook for 5 minutes, stirring frequently. Add 1 tbsp agave or coconut sugar. Mix well and cook for another minute. Sprinkle on top of the cake before putting it into the oven to bake. Preheat the oven to 350 degrees and line a 9 x 13 pan with parchment paper or grease as you prefer. In a bowl mix the oats with the boiling water and let them sit until the oats have absorbed all the water. Usually only takes about five minutes. In another bowl mix together the flour, baking soda, baking powder, cinnamon, nutmeg and salt. Set aside. In the bowl with the oats, add the agave, olive oil and egg whites and mix well. Spread the batter into the prepared pan (adding the optional topping if you’d like now), and bake for 20 to 25 minutes or until the cake is puffed, golden, and a toothpick inserted in the center comes out clean.